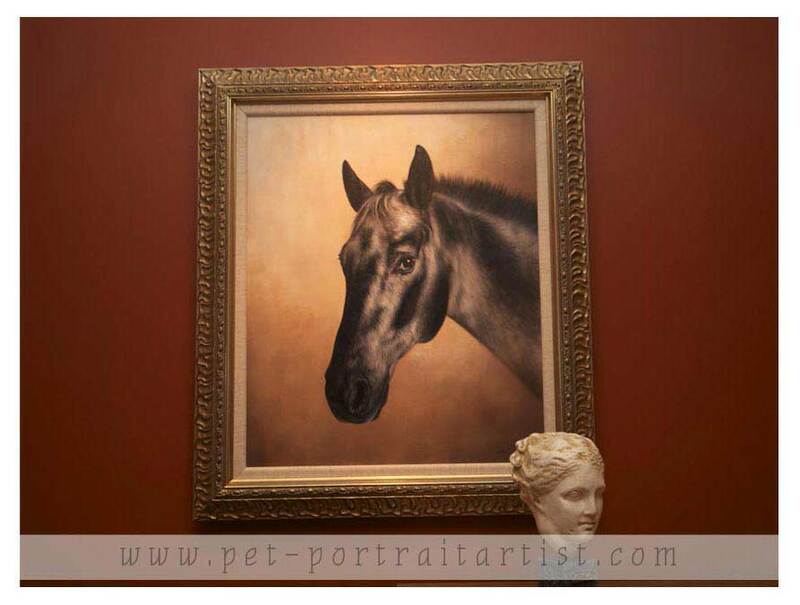 Kim (USA) emailed us in 2012 to ask if Nick would be able to paint their horse Jake along with a print that they could take to their wedding in France. 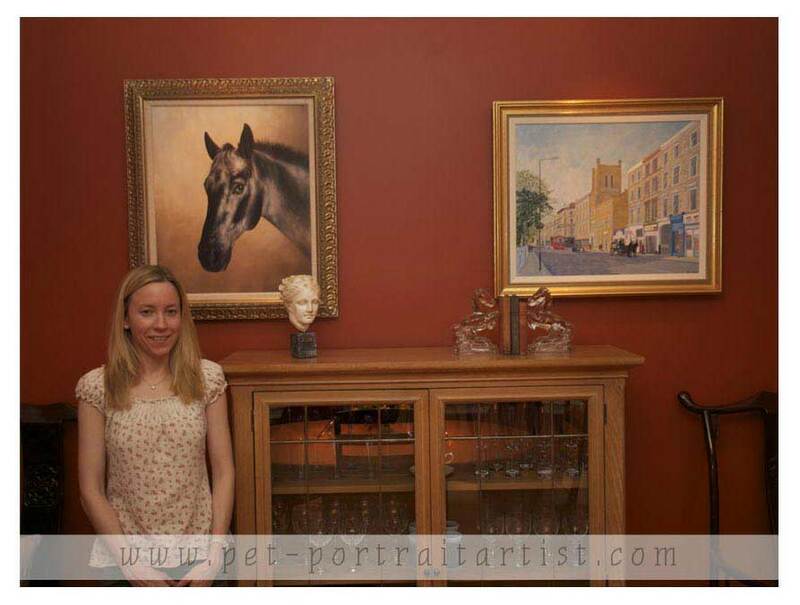 As you can see from the photos below Nick painted Jake 24 x 20 in oils on linen canvas and we had Jane our framer frame the portrait in a beautiful Pewter /gold ornate frame. Kim has very kindly sent us some wonderful photos of the portrait along with Kim too. I have also added some feedback from Kim below. Thank you Kim for taking these photos and allowing us to use them on our website. Comments left on our portraits in progress blog. Hi Melanie & Nick, It's ABSOLUTELY GORGEOUS! I just love it - it truly represents Jake's beauty and personality! Thank you so much! OMG – the painting of Jake framed looks absolutely AMAZING!!! I absolutely love it – it’s just stunning!!! Thank you and Nick both so much for creating this amazing work of art! I just absolutely cannot wait until it is hanging in our dining room. I will definitely take a few pictures so you can see how it looks. I am very happy to let you know that the portrait of Jake arrived safely! It looks ABSOLUTELY GORGEOUS in our dining room!! We could not wait to unwrap it (very impressive packaging that completely protected it!) and hang it up last night. Please see the attached pictures. It was difficult to capture a good picture with the right lighting, etc but you can at least get an idea of how wonderful it looks. The frame is also gorgeous and fits perfectly with the portrait. The print is beautiful as well and will be perfect to take to France for our Wedding. Right now, I have it hanging up in my office at work – it’s just perfect. Thank you both SO MUCH for the amazing work that you do. It has far exceeded our expectations and we could not be happier! We will definitely recommend you to others!